Hi, I did a trackback of my links and so your post about newspaperindex.com. 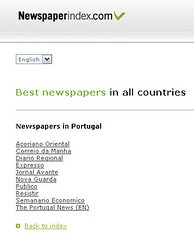 I have just updated the portuguese section, but it is hard since I do not speak a word portuguese. – And if anyone here could be interested in translating the site to portuguese about 2-4 pages + all names of countries – please contact me.